Tap “Jump” button to jump. Tap “Slide” to avoid obstacles. HD graphics, fully large screen support including tablet. Very good an fast tempo, and awesome sound track. 16 glorious achivements to be unlocked. Three modes: Training, Normal, Challenge. 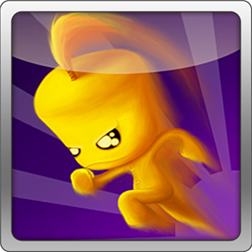 iRunner is a fast paced running game, with great HD graphics and game control. Mr. i, as the hair shows, is running as fast as possible to mysterious destination. You need to keep good tempo to avoid all obstacles on the way. Trying to collect as many batteries as possible while running. Collect gifts to turn into fever state – cooler dress, exciting tempo, and doulbe score!